Around 80 children under different age groups took part in the three days long folk music competition which started on February 23 at Language Centre New Academy complex. The program was organised by Jammu and Kashmir Academy of Art, Culture and Languages Kargil. The aim of the competition is to instil an appreciation for folk music among youngsters besides providing a platform to showcase their folk musical skills. 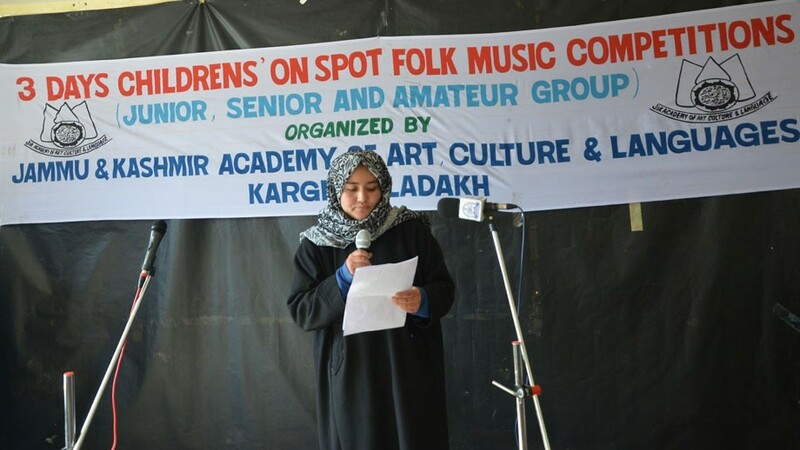 Welcoming the children, teachers, jury, and guests on the first day, Muhammad Ali Tak, Special Officer for Culture Kargil said that a series of such children based programmes being conducted by Cultural Academy Kargil in different blocks of the district. He said that the core idea behind organising such events is to introduce the young minds to the realm of creative arts in music and to invoke cultural awakening among youngsters. The children were categorized under age groups including Junior (9-13 years), Senior (13-16 years) and Amateur (16-21 years).